The marketing focus of this phone seems to be social use paired with an affordable price tag. Features like "Photo Booth," "Instant Collage," and "Social Square" give photo tools for grabbing the best shots, plus it has Android Oreo (Go edition) for leaner performance. Given the prices in the press release are in USD and EUR, I would imagine it should come to the US and Europe at a minimum, but there's no timeframe for that yet. Alcatel does have a page up for the phone on its site, though, so you can check out the different colors and specs. SHENZHEN, China, June 27, 2018 /PRNewswire/ -- TCL Communication is shaking up the entry-level smartphone space with Alcatel 1, the latest addition to the Alcatel 1 series introduced earlier this year. Following the footsteps of Alcatel 1X, the first device from a major global brand to come with an FullView 18:9 display under $100 USD, the stunning new Alcatel 1 makes it more affordable than ever to enjoy a smartphone with premium design, FullView 18:9 display and higher-end performance. Its social-ready camera features make it easy to capture and share special moments instantly. 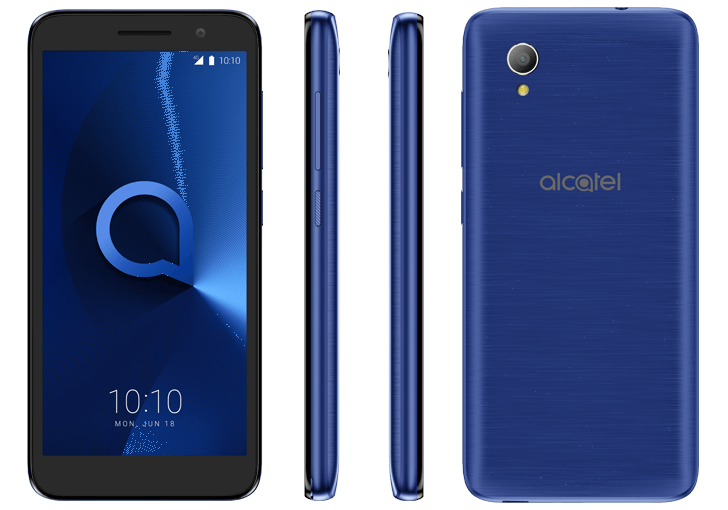 Alcatel 1 also comes with Android Oreo (Go edition), making it an ideal device for anyone who wants a solid smartphone at the much lower price without sacrificing features or functionality. "With an increasing number of people using their phones to consume media, Alcatel wanted to prioritize features that would serve their needs best. Our customers expect premium design, robust displays and the ability to share content quickly and easily," said Christian Gatti, Global President Alcatel Business Division and Executive Vice President TCL Communication. "Alcatel 1 breaks the mould and puts a smartphone filled with premium features within everyone's reach." Available at under EUR79/USD89, Alcatel 1 merges an immersive FullView 18:9 display, a premium aesthetic and fun photo-editing tools into one ultra-affordable device. As part of the recently announced Alcatel 1 series, the new smartphone is a highly affordable option that enables users to easily enjoy the latest in-demand features. Offering more vertical screen space, Alcatel 1 features a large 5-inch 18:9 display thanks to Alcatel FullView, the newest screen innovation using TCL's award-winning display technology and manufacturing capabilities. The 18:9 display format effectively delivers a 5-inch screen in a slim 4.4-inch form, providing a compelling viewing experience as well as more comfortable holding and usage. Alcatel 1 has an impeccable brushed metallic finishing making it more premium than its price suggests. It features quality materials and smooth curves available in metallic gold, rose gold, blue and black with a luxurious feeling that makes it as pleasing to the touch as it is to the eye. Its high-grade unibody ensures a sleek design that stands out. Designed for users who love sharing the moments of their lives through pictures with friends and family, Alcatel 1 comes with a 5MP rear camera with flash and an interpolated 5MP front camera. Alcatel 1 also provides an intuitive photo editing suite called Social Mode that lets users take, edit and share photos in a fast and fun way with tools including Photo Booth, Social Square, Instant Collage and One-Handed Mode. With Photo Booth, users can take photo booth-style keepsakes with their friends anywhere that are instantly sharable. Social Square keeps the camera viewfinder open while displaying photos the user just took below, so that they can stay in the photo-taking action. One-Handed Mode frees up a hand for users, letting them take quick snapshots with an interface that's customizable for their comfort. Under its stylish exterior, Alcatel 1 is powered by AndroidTM OreoTM (Go edition), which is optimized to help ultra-affordable smartphones run Android faster, more efficiently and safer than ever. Android Oreo (Go edition) is the ideal platform for customers who want to enjoy a powerful Android experience at an affordable price. Alcatel 1 with Android Oreo (Go edition) features a set of popular Google apps that run quickly and smoothly, including Google Go, Google Maps Go, Gmail Go and more. As part of the platform, users will enjoy access to YouTube Go, which lets users download videos and view them offline when data isn't available. The Google Play Store will also suggest third-party apps tailor-made for Go edition devices, including Facebook Lite, Skype Lite and more. Android Oreo (Go edition) is designed to give users two times the available storage out of the box, freeing up space for users to do a lot more with built-in storage on Alcatel 1, in addition to a microSD slot for up to an additional 32GB of expandable memory. Alcatel 1 will be available in select markets from July at prices starting from (EUR79 / USD89). For Alcatel 1, please visit https://www.alcatelmobile.com/products/alcatel-1.html. For more information on all of Alcatel's latest smartphone and other mobile devices, please visit www.alcatelmobile.com. TCL Communication Technology Holdings Limited (TCL Communication) designs, manufactures and markets an expanding portfolio of mobile and internet products and services under three key brands - TCL, Alcatel and BlackBerry - with its portfolio of products currently sold in over 160 countries throughout North America, Latin America, Europe, the Middle East, Africa and Asia Pacific. Incorporated in Hong Kong, TCL Communication operates nine R&D centers worldwide, employing thousands across the globe. For more information, please visit www.tclcom.com.